Founded in 2011 by Nadiem Makarim and Michaelangelo Moran, “Go-Jek” has become the most popular technology-driven personal ride-booking app in Indonesia. With the slogan “An Ojek for Every Need”, not only does it allow customers to arrange transportation quickly and easily using a smartphone application, it also provides an in-city courier services, food delivery services through Go Food, Go-Massage for massage service, Go-Glam for salon and beauty service, Go-Clean, and many other services. Competitive pricing, reliability, and generally good service quality, has attracted increasing numbers of customers to Go-Jek. After it launched the flat rate promo of IDR10,000 for all services on June 2015, the search for Go-Jek has soared and it has become the most searched brand compared to the other famous personal ride-booking app, such as GrabBike, BluJek, and Uber. 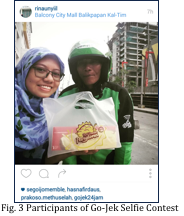 How Go-Jek gained its popularity in Social Media? 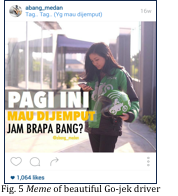 As the pioneer of motorcycle taxi app in Indonesia, many digital marketing tactics were used by Go-jek to increase their social mentions, especially on Twitter and Instagram. These are few things that managed to provoke the popularity of Go-Jek on Social Media. Unique Promos - One of their promos to boost up Instagram mentions was by holding a selfie contest with Go-Jek Drivers and posts it on Instagram by using #GojekDimanamana to win IDR100,000 credit. Another powerful promo of Go-Jek that significantly increased the brand awareness of Go-Jek on Twitter was the referral code promo to get IDR50,000 discount for those who downloaded Go-Jek app. Many people shared this promo on Twitter while using #GojekGotMeHere. Good-Looking Go-Jek Drivers – Not limiting itself to men as chauffeurs it has also hired beautiful women. These good-looking drivers have successfully garnered the attentions of many netizens. Many “memes” created out of these drivers’ photos have gone viral on Social Media, especially on Instagram with #MemeGojekKece & helped in creating a differentiation factor for Brand. Rejection from Traditional Ojek – There were many protests that came from local Ojek, even violent actions toward Go-Jek drivers from these local Ojek, but it only served in intensifying Go-Jek brand awareness among the people. 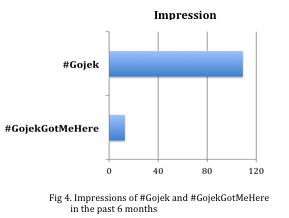 These violent cases garnered people’s sympathy & there were many shared tweets to support Go-Jek drivers using #SaveGojek. 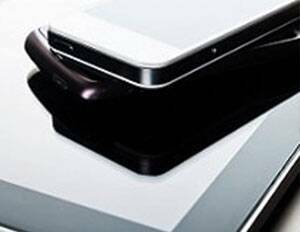 With the emergence of personal ride-booking apps along with the demand for such services it is not the service itself that will differentiate them but the innovative digital campaigns that these new age internet start-ups leverage to market them aggressively are the strategic plays that will differentiate them from traditional incumbents.